March can be a cold month in Toronto, Canada. 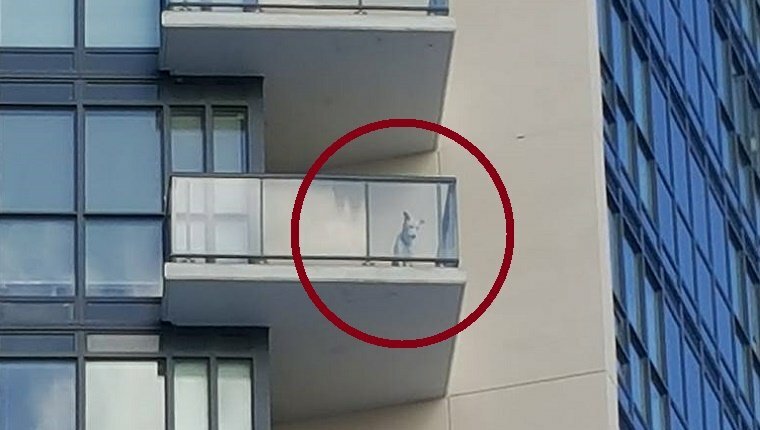 So when Facebook user RL Das saw a dog trapped on a 16th floor balcony, he knew the pup was in trouble. The temperature outside was around seven degrees Fahrenheit, well below freezing. And after hearing the poor pooch bark for 45 minutes, RL knew that no one was going to let the dog inside. He snapped a picture of the dog and posted it on the neighborhood Facebook page asking for suggestions on how to help the pup. Over 150 commenters and neighbors gave advice on how to handle the situation. Some were practical and said that RL should contact the concierge, the SPCA, and the police. Other commenters got creative in their desperation to help and suggested lowering a blanket from one floor above on a string, or using a ladder, or scaling the side of the building with a blanket. RL got in touch with the concierge, though he didn’t have clearance to enter the apartment, and the owner would not answer her phone. The SPCA couldn’t help because they couldn’t confirm the dog was in mortal danger. Eventually a police officer showed up and entered the apartment and let the dog back inside. The owner of the dog claimed that the wind must have blown the door open and locked it shut while her dog was outside. She has said that she will be taking steps to pet proof her apartment so doors stay closed. Other commenters dispute her claim that the wind was the cause and allege that this is the latest in a series of accidents involving the dog that don’t add up and, at the very least, amount to the owner being dangerously unfit to care for the dog. Still, it is great to see a community of neighbors come together to save a dog in need. They’ll certainly be keeping an eye out for this pup in the future. What do you think? Did the wind blow the door shut? What would you do to help a stranded dog in the cold? Let us know in the comments below!